Tonight, the finals of the 200 fly, 50 free, 100 back, 200 breast, 50 fly, and 400 free will be contested. 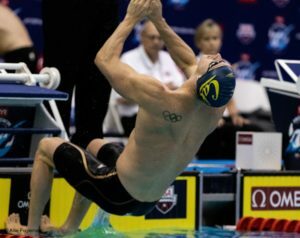 Caeleb Dressel and Michael Andrew will face-off again after Dressel won the 100 fly on Thursday while Andrew finished in 8th. The duo will meet up in the final of the 50 fly, where Dressel is seeded first while Andrew is seeded third. 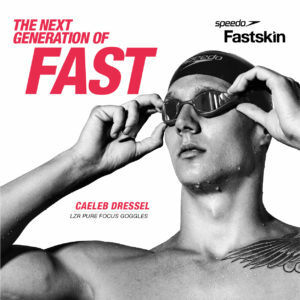 Yesterday, Dressel won the 200 free and 100 fly. Tonight, Dressel has a shot at swimming his second 2-for-2 win performance. 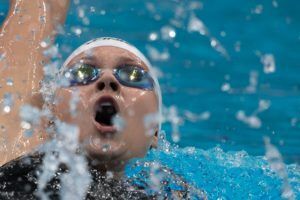 Veterans and age group-standouts will clash in the final of the women’s 100 back, with 18-year-old Katharine Berkoff leading the seeds as the only woman under one minute (59.78). Right behind Berkoff is Olympic gold medalist Olivia Smoliga, Pan Pacs champ Lisa Bratton, Olympian Hali Flickinger, and 14-year-old Claire Curzan. Amidst the battle, Curzan will be gunning for her second NAG of the meet, as her seed time of 1:01.08 lurks behind Regan Smith’s 13-14 NAG of 1:00.26. Curzan will also have a showdown with Kelsi Dahlia and Farida Osman in the women’s 50 fly after taking second to Dahlia in the 100 fly on Thursday. Osman is seeded first with a 26.32, however, the 14-year-old Curzan is seeded second with a 26.37. Dahlia lurks behind Amanda Kendall in fourth. Can the 14-year-old defeat these veterans in a good-old fashioned splash-and-dash? With Michael Andrew out of the 100 back A-final, Olympians Ryan Murphy, Jacob Pebley, and Matt Grevers will still have to face NCAA champ Coleman Stewart, who was sub-55 in prelims. In the B-final, 14-year-old Josh Zuchoswki could also gun for a NAG of his own. His prelims time of 57.48 is just three-tenths off his PB of 57.11, which is eerily close to Michael Andrew‘s 13-14 NAG of 56.83. Katie Ledecky is scheduled to swim an interesting meet line-up tonight. First up for Ledecky is the B-final of the 50 free, where she is seeded 15th. Then, Ledecky will octuple the distance and swim the 400 free final, where her and Leah Smith are the lone sub-4:10 swimmers from prelims. Hali Flickinger held off Katie Drabot and Kelsi Dahlia in the last 100 of the race, earning the win in a 2:07.03. 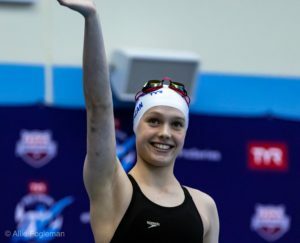 Flickinger knocked off 0.06s off her season best of 2:07.10 and ties herself as the 2nd-fastest time in the world with Japanese swimmer Yui Ohashi. Both Drabot and Dahlia entered the top 20 times in the world, joining Flickinger as the 3 Americans in the top 20 times (#2, #13, #19). Chase Kalisz was even with Bulgarian Antani Ivanov heading into the final 50. However, the 20-year-old Ivanov held off Kalisz into the finish with a now 16th-fastest time in the world (1:56.34). Kalisz settled for second with a 1:57.03. 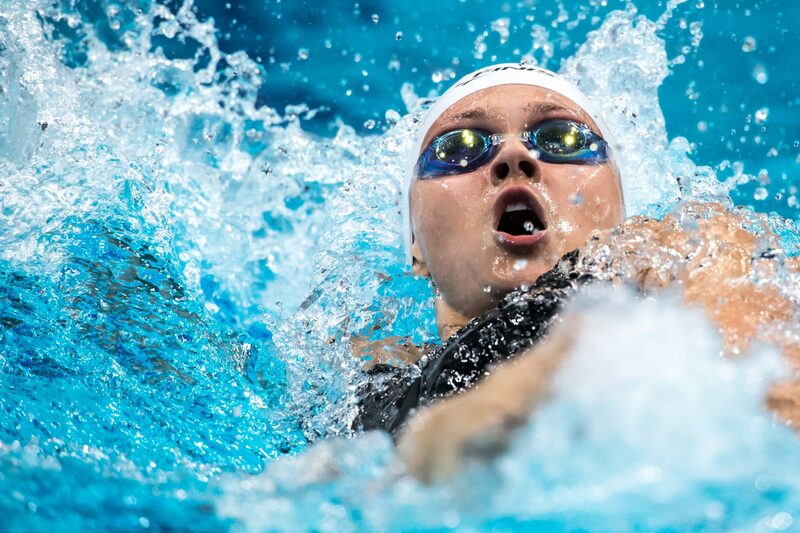 Out of lane 7, Olivia Smoliga pulled out the win over Simone Manuel and Farida Osman. Smoliga’s winning time of 24.83 just put herself in the top 20 times this year. Manuel and Osman tied for second, both sub-25 with a 24.97. A familiar top two, Ryan Murphy and Matt Grevers went 1-2 in the 100 back final, both swimming under 54 seconds. Murphy was faster in Knoxville with a 53.17, the 4th-fastest time in the world. Grevers’ runner-up time of 53.81 is the 13th-fastest time in the world this year. Out of the B-final, 14-year-old Josh Zuchoswki successfully broke Michael Andrew‘s 13-14 NAG. Zuchowski took third in the race with a 56.62, clipping Andrew’s former NAG of 56.83. 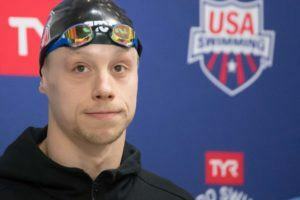 In prelims, he swam a 57.48, however, is former PB was a 57.11. Egyptian Farida Osman had a stellar 50 fly final tonight, breaking Kelsi Dahlia‘s PSS record with a 25.65, maintaining her #2 spot on the top-10 times in the world. Dahlia settled for second place with a 25.90. 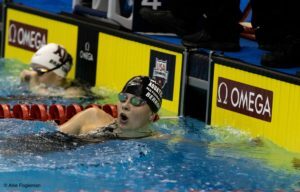 For 14-year-old Claire Curzan, her 3rd-place time of 26.18 was nearly two-tenths faster than her prelims time of 26.37. Her time is also the 15th-fastest time in the world this year and the 9th-fastest U.S. performer all-time. Swimming the 2nd-fastest time in the world, an unsual position for this star, was Katie Ledecky. Her winning time of 4:01.50 is just 2 seconds off of Aussie Ariarne Titmus’ leading time of 3:59.66. Leah Smith‘s second place time of 4:05.17 bumped her up from 15th to 5th in the world this year. Third-place finisher Kaersten Meitz took third with a 4:09.20, just sneaking into the top-25 times in the world. Picking up his 5th PSS win was Denmark-native Anton Ipsen, who held off Zane Grothe 3:48.22 to 3:48.53. In Des Moines, Grothe out-touched Ipsen and took the win. But this time around, Ipsen was able to hold and maintain his lead. Both Ipsen and Grothe’s times are right outside of the top-10 times in the world this year. 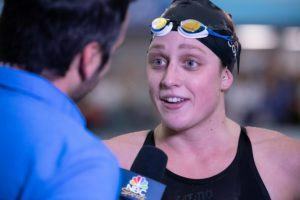 Ipsen is also qualified for the 2019 World Championships this summer, scheduled to swim the 800/1500 free and 400 IM for Denmark. I’m predicting Andrew wins this one. They get a lot of flack on here, but USA swimming do far better than most providing streams for their events. I’d be over the moon if BS could muster anything remotely similar. Russia has been doing a phenomenal live stream (free around the world) this week. And the Russians are using those amazing spectator-friendly colored lane lines to boot! You will me lol but I totally agree.